Bulls star Derrick Rose continues to be a question mark health-wise. Chicago Bulls guard Derrick Rose said he was still experiencing double vision as recently as Thursday, but he’s been cleared to make his preseason debut on Friday in limited minutes. Hoiberg said Rose would play two “four- to five-minute stretches” and play “seven to 10 minutes” overall. Rose’s first stint will come as a reserve with Joakim Noah and Taj Gibson up front. The plan is to start him in the second half with starting big men Pau Gasol and Nikola Mirotic. This doesn’t guarantee he’ll be ready to play on opening night when the Bulls host the Cavaliers on Oct. 27, but it’s an important first step in the process. And it’s one that Rose needed to take. Under Hoiberg, the Bulls’ offense looks nothing like it formerly did when Tom Thibodeau was coaching the team. Rose is a talented enough offensive player that he’ll likely be able to fit into the scheme without a ton of practice, sure. But NBA offenses are becoming increasingly intricate, with timing down to the second. 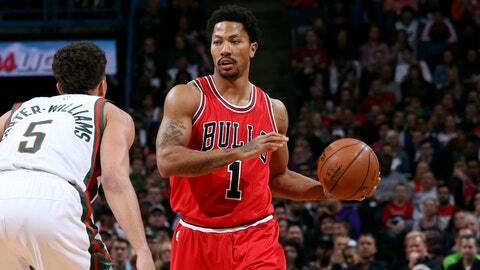 If Rose isn’t in the right place at the right time, it could cost the Bulls when the games start to count for real.